The forest prince was born in "Bambi" (1942). A young deer prince whose father is king of the Forest. Sora can call on Bambi for help anytime. A young deer, son of the great stag who rules the forest. Bambi is a young fawn and the son of the king of the Forest. He appears as a Summon in Kingdom Hearts and Kingdom Hearts Chain of Memories. He first appeared in Disney's 1942 animated classic, Bambi. Bambi's home world was destroyed by the Heartless. However, the innocence and purity of the young fawn's heart allowed him to be preserved in the form of the Naturespark Gem. After Sora finds this item in the 100 Acre Wood and takes it to the Fairy Godmother, she restores Bambi's spirit and Sora gains the ability to summon him in battle. After the Keyblade wielder seals Kingdom Hearts, Bambi returns to his home world. In Castle Oblivion, Bambi reappears as a figment of Sora's memories in the form of a summon card. Sora obtains Bambi's summon card after completing the 100 Acre Wood floor. When summoned, Bambi prances about the area, dropping large quantities of HP or MP orbs in the process. Any enemy defeated while Bambi is present on the battlefield drops more orbs than usual. Also, the more enemies Sora defeats while Bambi is summoned, the more orbs Bambi drops. Every enemy defeated fills the secondary blue gauge, and every time the gauge fills completely, the fawn will make a great leap and drop a special item. Bambi appears as a summon card after clearing 100 Acre Wood. When his card is used, Bambi runs around and drops HP orbs around the field for Sora to collect. Stocking multiple Bambi cards create the Paradise Lv2 and Paradise Lv3 sleights, which increase the amount of orbs dropped and, in the case of the latter, stuns enemies. Idyll Romp, another sleight exclusive to Bambi, causes him to roam around and confuse enemies. The Bambi card is also used in the Gifted Miracle sleight, outside of Halloween Town. Additionally, Bambi can be used as part of magic sleights that require the use of any summon card, including Confuse, Gifted Miracle, Tornado and the Halloween Town-exclusive combination for Terror. Bambi is the main character in Felix Salten's novel Bambi, A Life in the Woods. He also is the main protagonist in Walt Disney's film adaptation of the novel and its midquel, Bambi II. In Disney's 1942 animated classic, the titular character Bambi is a young fawn who will some day become the Great Prince of the Forest in place of his father. Bambi makes two close friends growing up: an energetic rabbit named Thumper, and a bashful skunk named Flower. The fawn is quite attached to his mother, but during his first winter, he is devastated when hunters (known to the woodland creatures as "Man") shoot and kill her. 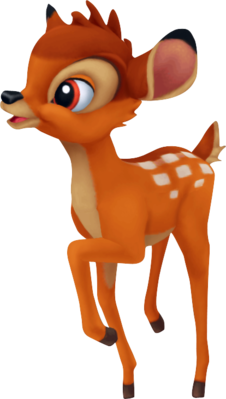 When Bambi reaches maturity, he becomes "twitterpated" with Faline, a doe he knew in his youth, and defeated Ronno, his childhood rival. In the film's climax, a terrible fire started by Man wreaks havoc on the forest. After he saves Faline from a pack of vicious hunting dogs, Bambi joins his father and the other animals on a sheltered riverbank. The next spring, Faline gives birth to two fawns under the watchful eyes of Bambi, the new Great Prince of the Forest.